Combine garlic and rice flour in a large freezer bag and set aside. 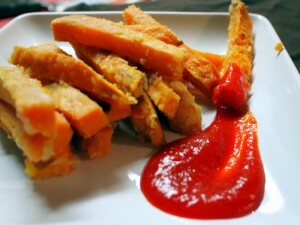 In a large bowl combine sweet potatoes and almond milk. With clean hands, gently combine until all of the sweet potato fries are evenly coated. Transfer the fries to the freezer bag. Seal the bag and shake vigorously until the fries are evenly coated. Transfer the fries to a non-stick baking dish and spray thoroughly with the non-stick cooking spray. Season with salt and pepper then bake at 350 degrees until tender and golden brown, 15-20 minutes. Serve with your favorite condiment or Aji.